Japan has always been known for its rich traditional art. Japanese art is characterized by several different forms of art. Japan is known for its rich aesthetic art all along with the traces of some foreign influences in their art. The history of Japanese art if very long which has gone through several different phases such as at one time the Japanese art was under a heavy influence of foreign ideas, while at the other, the art form was purely based on their on thoughts and ideas without any foreign influence. Japanese traditional art is quite rich as available in several different forms. Several different mediums of expression have been used by Japanese artists to express their ideas. Japanese traditional art is based on attractive Japanese paintings, the well-formed Japanese pottery, the Japanese Sculptures and the most distinct form that involve the arrangement of flowers, i.e. Ikebana and of course Origami, the art form related to folding paper. Following are given some of the different types of Japanese traditional art that has fascinating the people for years. 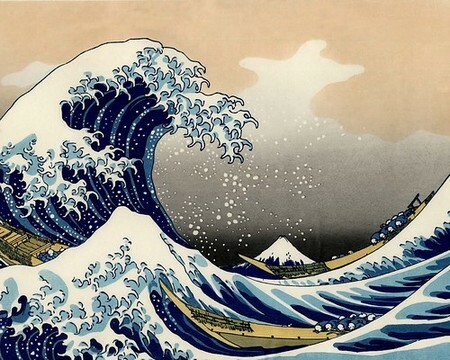 Japanese paintings are known to be the oldest art form of Japanese traditional art. These paintings are unique and have some distinguished features. Japanese paintings not only portray the individual ideas of the Japanese artists but also show hint of foreign influences as well. Over the course of Japanese history, Japanese traditional art had gone through several phases. One such phase in Japanese art was the introduction of wall paintings (murals) at some point in Nara period. Murals were commonly displayed on the walls of the Horyu-ji, a temple in Ikaruga, Nara. The paintings made by the artists follow the same painting styles as that of Chinese paintings and were usually based on religious beliefs and tales. Over the course of history, Japanese art came across the images of Mandala which means ‘circle’ in Sanskrit. In Buddhism, the majority of the sacred art takes the form of Mandala. By the mid-Heian period, the traces of Chinese art styles cleared from the Japanese art. It was somewhere in 14th century, when the influence of Zen monasteries became so prominent in the Japanese art. It was the time when Yuan and Sung dynasties introduced an Ink painting in Japanese art. During this time, the monochrome landscape paintings began to be popular. At the end of Muromachi period, the decorative art style became dominant over the ink paintings. Somewhere around Azuchi-Momoyama period, the Japanese art viewed the introduction of gold and silver foil in the art forms. Several different styles were introduced in the Japanese art In Edo period. Monumental landscapes and wall paintings beautified the sliding doors and castles respectively. During the Meiji period, the Japanese art became under the heavy influence of western art, however, the art critics in Japan done a great job in the revival of the Japanese art in its original form such as Nihonga art. Presently, Japanese artists have integrated many new themes and abstract paintings in the Japanese art to keep pace with the present demands of the society. Nihonga is a form of Japanese art which is still presented in several different ways, especially with modern themes and mediums. Previously, the pottery work in Japan was based on coil, adorned with rope patterns and all the work was done with hands. With a view to retain the native styles, many artists studied the traditional methods. 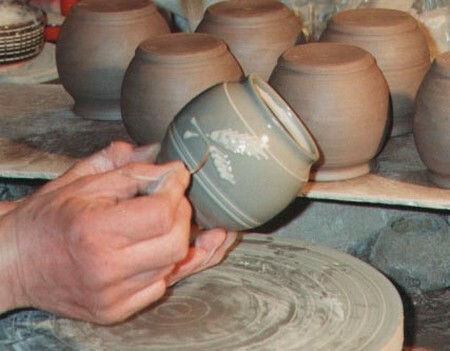 During the course of Japanese history, several different styles developed and were crafted by Korean potters at first. Classic wares were excessively created during the 1980s and dragons and floral designs decorated with the Arita porcelain. The bizen ware crafted were reddish brown in color and strong as iron. Japanese sculpture on the other hand is known for its own characteristic features with an emphasis on Buddhism. Different periods of history saw many different modified forms and styles of sculptures. Previously, metals and wood were the main ingredients used in crafting sculptures. However, clay was used to craft the images of dogu and haniwa. Hakuho art period is known for seeing some remarkable Buddhist sculptures. As the time passed, new ideas and material has been introduced to craft different sculptures. An important progress was the flourishing of outdoor sculptures which are now used in the parks or other landscapes. Bonsai which is pronounced as ‘bone-high’ is one of the oldest oriental horticultural art form of Japanese art. In both Chinese and Japanese, the term ‘bonsai’ means ‘tree in a pot’. This art form was first developed in Orient about 2,000 years ago. Presently too, the refined form of bonsai art is practiced in different parts of the world. We cannot say that a planted tree in a pot is bonsai unless the tree is properly pruned, shaped and trimmed into a particular shape. Generally, bonsai is a form of Japanese art where a tree is customarily dwarfed by using Japanese art techniques. So, bonsai are the trees which require some special care in terms of pruning, shaping and training so as to keep it going for a longer period of time. It is said that a bonsai can live up to hundred years if cared properly. Bonsai can take some additional styles with some embellished forms. Ikebana is a form of ancient Japanese art which is based on arrangement of flowers. Ikebana is an art form that based on some strict rules in order to attain harmony, balance and elegant arrangement of flowers. There are number of schools scattered all over the Japan that provide formal training to the people to learn essential techniques and principles regarding ikebana. It is worth mentioning that Ikebana is far different from other western flower arrangement techniques. In Japanese language, the term ‘origami’ literally means paper folding. This is a form of Japanese art that involves paper folding. 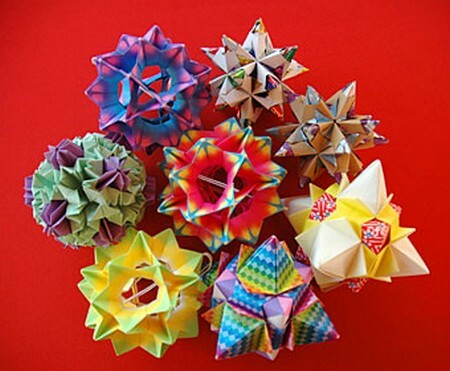 Origami is an art form of which formal schooling is available in Japan, where the students interested in this art are taught the different skills and arts to craft things or objects from folded paper. Not all the origami pieces are alike rather these can be different in their sizes and designs, i.e. they can range from simple folded boxes to complex objects or things formed by connecting different pieces of paper. It is an important event in the Japanese culture. Tea ceremony is celebrated in several different styles in different regions of Japan. The main feature of tea ceremony is that it never recurs in exactly the same way as it held once. Chashitsu is a room where tea ceremony is held. This room is positioned within the teahouse but away from residence and is only designed and decorated for this tea ceremony. If we go through the history of Japan, we will come to know that Japan has a very rich history of poetry. It was hundreds of years ago when the poetry was first introduced in this part of the world and over the time, it became an important part of Japanese culture. The poems which are written in Japanese are given the name ‘wakas’ meaning ‘Japanese Poems’. The Japanese poetry is poplar for its simplicity. It was in 17th century when calligraphy started becoming popular in Japan. Buddhism reached Japan from India where it travelled through China and Korea and finally reached Japan where many people among emperors converted to Buddhism. Earlier Buddhist scriptures were written in Chinese writing. It was believed that the Buddhist monk Kukai was the first Japanese calligrapher who rewrote the section of five paneled screen. 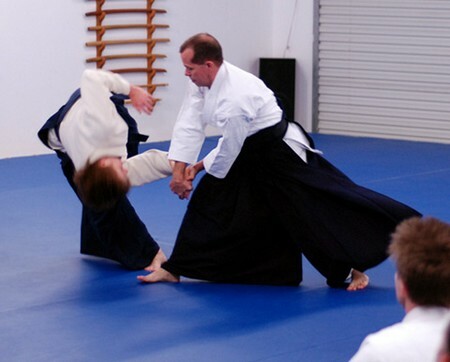 It was in medieval period when martial arts began to gain popularity in Japan. Samurai class practiced martial arts. The term ‘martial’ means ‘fighting’ which means that martial art is an art of fighting. It helps people to defend the attacks from enemies. In Japanese language, the term ‘ukiyo-e’ means the picture of the floating world. The phrase ‘floating world’ indirectly symbolizes the insular, carefree and pleasure seeking world of Japan particularly in Edo period. Ukiyo-E is basically an art that includes woodblock prints and watercolors commonly used between the 17th and 20th century. This art most of the time symbolizes the scenes or landscapes of city life, scenes from the pleasure seeking quarters of Japanese cities and also scenes from the history and culture. 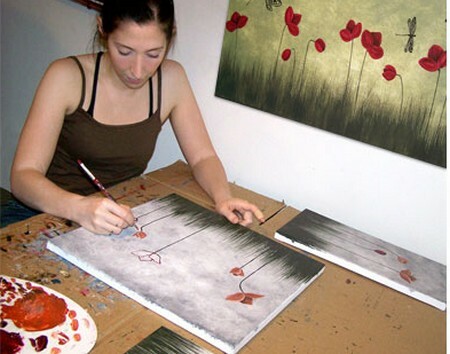 The first picture of the women making the flower painting is really interesting. What is her name? I’m doing a similar painting and I have to recite where I got the picture from and who originally made it. Your cooperation is highly appreciated.